Professional Home Inspections in Midland by a Certified Building Code Official. Roger Frost is a Certified Master Inspector who has completed over 7,500 Residential Home Inspections. The Midland Home Inspector offers a 100% Money Back Guarantee on every home inspection. Enjoy a Risk Free home inspection when purchasing property or investments in the Midland and Local Area. The Midland Home Inspector provides both Residential and Commercial Property Inspections. Roger is a member of NACHI , OBOA, WETT Inc and NACBI. Let our Knowledge, Experience and Training protect your investment when purchasing a new home or commercial property. Thermal Imaging is included with every home inspection. 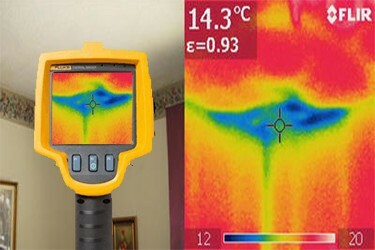 Thermal Imaging can help find missing insulation, hidden moisture and electrical hot spots. Most of these items are not visible to the naked eye and would be missed if not using Infrared Technology. The Midland Home Inspector was the First Home Inspection Company to provide Thermal Imaging in Simcoe County. When making one of the largest investments of your life do you want to gamble on missing hidden defects? The Midland Home Inspector has been WETT Certified for over 15 years. 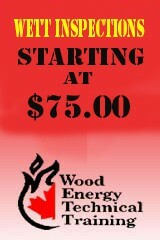 We provide WETT Certified Inspections for only $75.00 when included as part of home inspection. Most insurance companies will require a WETT Certified Inspection if you have a Wood Stove, Fireplace, Fireplace Insert or Pellet Stove installed in your home. We provide your WETT Inspection Report at the time of inspection. Prior to booking a WETT Inspection we recommend you call us to discuss your particular installation to ensure that your Wood Burning Appliance would or would not meet installation requirements. Consultation is always available and is FREE. Call the Midland Home Inspector Today!